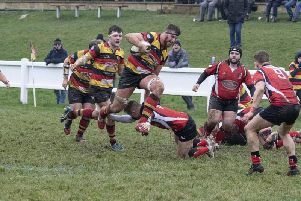 Harrogate RUFC scored 42 unanswered points in the first half of Saturday's trip to struggling Wilmslow as they powered to a comprehensive bonus-point victory. Their 54-5 triumph in Cheshire boosts the Aces' promotion hopes and leaves them within touching distance of second-placed Blaydon, the side currently occupying the North Premier's solitary play-off berth. The game began with the 'Gate defence being forced to contain a series of Wilmslow raids until flanker Hugo Tasker intercepted a wayward pass and raced clear to register a try converted by the boot of Nathan Wyman. Some powerful scrummaging led to the visitors putting their hosts under increased pressure with concerted attacks well-orchestrated by half-backs Danny Matthews and Sam Fox. Telling breaks from Wyman, Oli Rossillo, Andrew Lawson, Luke Riddell and Matt Lansdall followed, but it was a nicely-controlled driving maul from a line-out which led to the next score, outstanding number eight Jonny Coser applying a finishing touch. Harrogate’s set-piece dominance created a constant supply of good ball and individual Fox breaks sparked further attacks. Coser, Sam Brady, Luke Watts and Martin Dodds repeatedly stole Wilmslow line-outs and the mounting pressure resulted in the desperate home defence conceding a penalty try which took the score to 21-0 after 25 minutes. More forward drives led to the next touchdown of the afternoon, Brady the man who made it over the whitewash on this occasion. Dodds then grabbed the next one following a powerful 30-metre run, extending the away advantage to 35 points. The final score of the opening period provided the game’s champagne moment, Watts breaking strongly before Lansdall recycled the ball and Rosillo danced through the defence for a spectacular individual converted try. The second half started with an excellent high take by rock-bottom Wilmslow’s Kyle Mellor, sparking more attacks from the fired-up home side. 'Gate then went offside, a line-out followed the penalty, and prop Robert Taylor crashed over to reduce the deficit. Driving rain and poor light led to a plethora of handling mistakes from both sides but the visitors maintained control, particularly after home scrum-half Sean Street was sin-binned for dissent. Harrogate forward drives continued and the ball was quickly spun right for Riddell to beat the cover and touch down in the corner. More of the same was to follow and this created space for Tasker, who used his pace to take him over for the game’s final try. Next up for Dave Doherty's team is a home clash with 12th-placed Kendal at the Stratstone Stadium on February 9, 2pm kick-off.